The alchemist ranking gets reset on a semi-regular basis, so the current top 10 are at least somewhat recently active. This isn't decades of cumulative points on the /alchemist list right now. It was reset early last year IIRC. I can also think of 3 other brewing systems. The old school food cooking system, Geneticist +20 foods and SinX create EDP. If you think the ranked potion market is too hard to break into, try one of the other 3. Find out what else in demand and make it/farm it. Outside of brewing there's like 3,000 ways to make zeny on iRO and many of them don't involve setting foot outside of town/Eden. Selling slims and food sound fun . But I'm not interested to make zeny from slims at all. Many people just want to make slims for their own characters & close friends. With out messing with inconsistency of price & availability of the ranked sellers. - no one could control the price , they can sell it for 10k , 100k , anything . - nothting guarantee availability , imagine the top guilds monopolizing each 10 ranks - and kept slims for only guild usage ? ( never seen the 2nd place vending his slim at all ) ---> Which mean one of the game content get locked from other players. - Effectiveness of condensed potion should tied with the user , not the brewer. my character should become compatible with the N slims , and got more healing effectiveness . The rank of slim should tied with my Character. Not the seller. - With this system , the old brewers still have their old customers as reward of 10 years brewing. - New brewers can brew as many as they want for friends . With equality in effectiveness. - To maintain their rank with slims. People need to buy more and more slims of specified brewer. - Selling ingredients on cash shop is fine . Edited by zeywei, 14 January 2018 - 04:54 AM. Please remove Brewer's range system . 1#st 's slim goes beyond stellar price now (from 3000z to 3500 , then 4500z within months ) . Over 10,000 alchemists in the game , why let only 1-4 people monopolized the market ??? I cant understand this mechanism at all . I paid VIP like them , i played Alchemist like them . I spent the same amount of ingredients per slim like them . Why only their slims got extra healing ??? Because they're veteran brewers and made more slims ?? They invested on God Items for extra DEX ?? New players cant brew stuffs like them because they didnt have zeny to invest ?? This truly - absurd system should be removed . People logged to this game to be FREE. Not to get locked inside another capitalism . Or just adding slims "home made" effect. People will create their own brewer for their personal use , and then true competition begin if they want to make a fortune from slims. - More Brewers , more competition . - Benefits to new players . - You can made it to VIP only feature . - WP lose nothing , only get more new players and more $ from VIP. Please let me cook stuffs with enough Nutrient and feed my family instead of buying expensive can foods. Thanks. Slim is not a goal of competition , most events and activities in this game driven by slims. Its a basis which driving players to waste their time with this game , which make them paid WPE . Forcing people into competition for basis elements only create another bottleneck which blocking tons of activities. As far as i know the current brewing system was very old system derived from very long past . ( While people still paying for airtime ? ) . It was designed to make people wasting more time - to pay more. Now the game offer unlimited airtime and unlimited account creations . Old players stacking more accounts to stocking slims. And transfer them with automations. That is , how the old system mutated into monopolization. You cant won MVP / Instance / Woe without slims. And you can see double monopolizations when big guilds bought a whole slims from the market. Edited by zeywei, 15 January 2018 - 12:40 PM. In my experience, WoE whites were much better for staying alive in WoE versus ranked slims. We also have Toy Syringe and Flamel Card now for 150%/200%+ potion recovery rate. Ranked only adds 50%. I've used unranked slim whites plenty when I was doing the WoE investment thing instead of selling them. That 50% difference really isn't a game-changer for most cases. RODEX extra potions to yourself to make up for the difference in healing efficacy. You can keep campaigning for a system revamp that is almost certain to never be realized, or you can adapt to the tools we currently have available, which is always changing and improving. My brewer has been ranked and I haven't brewed slims on him in months, been using Ren's instead and supplying sands to her. Ren always buys sands at like 1.5k less than she sells her slims for. If you are really hunting sands yourself, why not just sell them to ren's buy shop and buy her slims? It's basically the same cost as brewing yourself, they will be ranked and you won't have to spend all of your own time. My storage always filled with 1# slims . I never had problem buying it. The real problem is availability . When big guilds or another player bought a whole slims from vends. Once slim turned 4,500 you can notice big inflation . Everything +20% ? Thats how slim effect the whole game. Because its basis of playing , which should be controlled directly by WP. WP just handling the future of this game to only 1 brewer. Supply and demand? Less people sell sand = pay more for sand, pay more for sand = need to sell slims for more. Availability of gum from OCP's affects pricing on stuff, drop events effect stuff and turn in's/ spotlights. People also use other things to heal and some don't even need healing items with their hp leeching builds. To claim the market is controlled by a brewer is far from reality. This topic is made specifically to share the schedule for iRO in 2018. If you wish to suggest or discuss things that are not mentioned in the OP I will politely advise the users to open a fresh topic. This is to avoid derail and to keep the discussion on topic. Past this point, postings that do not belong to the thread will be marked as derail and removed without notice. Edited by VModCinnamon, 16 January 2018 - 01:30 PM. 2) When will be the release of Illusion dungeons and Illusion weapons? 3) When can we enchant the Sky fortress weapons (Lindy Hop, JDR, Sunny)? 4) When will Fallen Warrior Armor arrive because Fallen Warrior Manteau needs it to gain its other effects? Since this server consist of players from various countries, will there be some sort of official International Tournament/Championship where the strongest guilds on both servers will be represented. It will be hosted online in conjunction to WP twitch. I think 7 vs 7 will be fine for this tournament. For practice purposes,I think Sakray server can be used. Homunculus WILL NOT initiate battle mode even if the master is under attack. Now this is stupid, why the hell do we have AI for then? Like if I get mobbed and focus on an ennemy, I expect my homun to help me with the rest. Edited by bearl, 17 January 2018 - 06:52 AM. Its really expensive to have those enchants on the old headgears but its all RNG. Some may have it for a few million zeny but others might get it until all billions have been spent. Any idea as to where can we enchant the sky fortress weapons when this enchantments are in place? Edited by angelopaol1011, 17 January 2018 - 03:09 PM. They're referring to this one, I think. So regarding the CC nerf update, it wasn't clear to me whether it has been delivered or not? Cart Cannon? It's definitely not nerfed, at all. Hmm. I hardly confirm about that. And then I checked random KRO genetic video. It seems element (from cannonball) only endowed on Weapon+EquipAtk only. And IIRC. Cannonball element always override elemental endowment by anymean, even from Dieter buff. So. only 4 elements available for Cart Cannon and Arm Cannon, neutral, holy, shadow and ghost. Edited by Sigma1, 05 February 2018 - 04:19 AM. for 30 secs, it will convert incoming damage from target to recover user hp. ie : 100k crit to enemy becoming 100k heal to them. 2) Switch location, similar with Kagerou/Oboro skill. 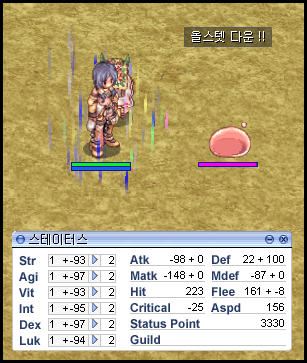 debuff that given to target by rapidly reducing their hp based on the distance between user and target. intended to give a monster protection from Melee attackers. all attacks from the same attribute will be miss. there are 10 type of attribute immunity effects, such as Wind, Water, Earth, Fire, Ghost, Holy, Shadow, Poison, Race and Gender. ie : Immunity to demi-human attacks, immunity to male character attacks. a debuff that significantly reduces target's status for a certain amount of time. Edited by Silvianna, 05 February 2018 - 05:11 AM.